Race started at 16:10 in light westerly breeze. Course was two laps of the circular course used for the first points race. Diana Parkinson in Avocet led at both windward marks by several boat lengths and was still leading round the final turning mark for the line and went for the Committee Boat end of the line. She failed to spot how the line was lying and both Pa Pa II and Debutant went for the Limit end and finished ahead of Avocet. This entry was posted in DB Weeks, Uncategorized and tagged Full results, Long Distance, Opportunity, Trophies, Trophy List on June 10, 2014 by Tim. A fleet of 26 DB assembled at Rock on the Camel Estuary in North Cornwall for the first championship race in the afternoon of Sunday 25th May. For the record this was the sixth time Rock Water Ski & Sailing Club have hosted the YWDB championship and the sixth time Martin Hough has been race officer for the event. The venue offers racing in a tidal estuary with mainly very flat water and some quite shifty winds. The shape of the sand banks change every year so it’s hard to become a master of the area unless you sail there on a weekly basis. The championship races took place over the late afternoons of four days of strong spring tides. The entrants included three past champions who had 17 previous championship titles between them so completion was likely to be intense. 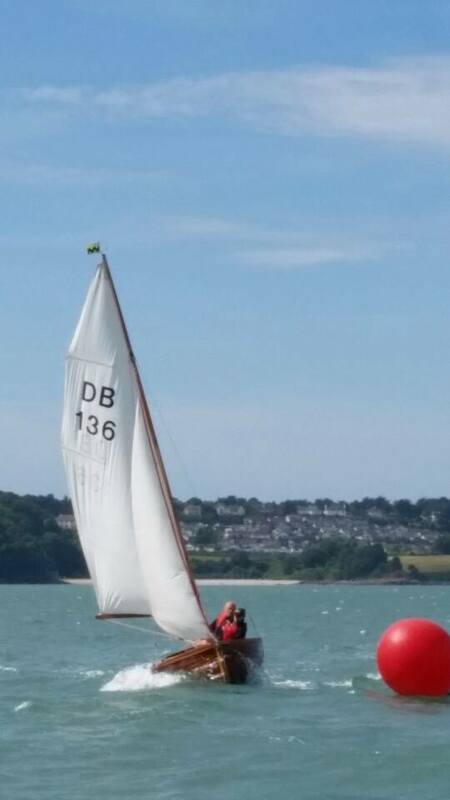 The breeze for the first race on Sunday afternoon was light and variable and Nigel Young sailing with his son, Jack aged 12 soon demonstrated just how fast their smooth hulled wooden DB, Papa 2, can be sailed and achieved their first win. Talking to Nigel after the racing he told me that their boat was fast upwind but Peter Hewitt the 2013 National Champion was faster downwind using his fly away pole set up. It was to be the theme of the week until Nigel and his 12 year old Son Jack started to speed up downwind as well as the week progressed. Peter Hewitt crewed by Chris Lockett in Merlin notched up what turned out to be the first of 4 consecutive second places and was giving the Young due a close race all the way around the track. It was like the two boats were attached by elastic, PaPa 2 pulled away upwind and Merlin reeled them back in on the down winds. Fortunately for the Young duo they always seemed to hold onto the lead by the slimmest margins before the final upwind. Races 2 & 3 were sailed back to back on Monday afternoon with wind still light but having veered north westerly. Pa Pa 2 won both races with Merlin coming second in the first race of the pair. 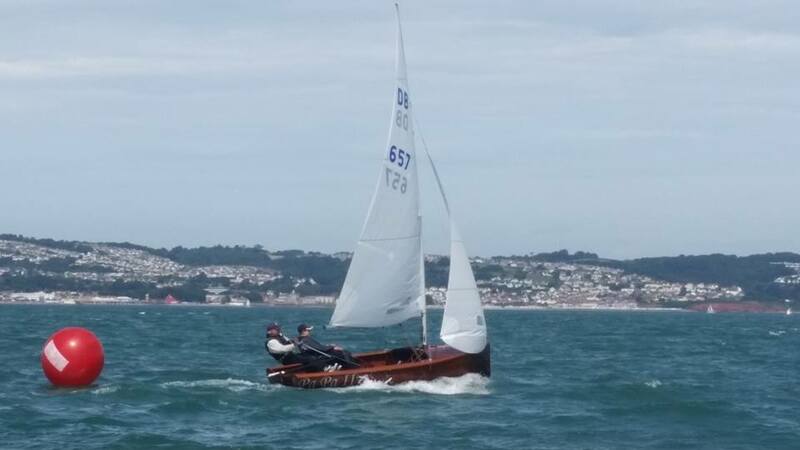 Murray and Theresa Glenister in Lyberty achieved their second third place in Race 2 but in Race 3 Tim and Diana Parkinson in Avocet took that position. PaPa 2 seemed particularly comfortable in the light winds of the week so far and again talking with Nigel after racing I found out why. Jack of course is very light and only weighs 35kg which helps in the light winds. But also it turns out that the last two regatta’s Nigel sailed were in Lake Balaton in Hungary where the winds were super light and shifty. Nigel has the right mind set for light airs sailing and does not get frustrated when things go against him. That and clean air are vital for success in the light winds. Race 4 started at 16:00 on Wednesday afternoon with the wind having strengthened to a generous force 4. With three firsts already Pa Pa 2 had to achieve third position or better to take home the magnificent championship cup. At the start PaPa 2 had their only bad start of the week and had to abandon starting on the pin and weave their way through the fleet on Port tack to the unfavoured side of the course. From onboard their boat the view of Merlin and Lyberty heading around the windward mark with the Pa Pa 2 100 yards back meant they needed something special to secure the championships with a race to spare. As the tide was running at full strength when the leaders arrived at the bottom mark the whole fleet compressed heavily and this allowed the Young duo a chance to get back into the race. With Merlin and Lyberty fighting Pa Pa 2 could sail their own race and very quickly they were back in more familiar territory. A few tacks later towards the favoured side and Pa Pa 2 found themselves just crossing ahead of Merlin and hit him with a slam dunk tack. That was the turning point for race 4 and Pa Pa 2 did all they could to slow Merlin down on the upwind to give them a cushion down wind to be assured of the 2nd place and the Championships overall. So when Lyberty achieved a fine first place with Pa Pa 2 snapping at his heels the championship was decided. Merlin was third to end his run of three second places. Race 5 followed on and Pa Pa 2 again took the first place signal chased home by John Waters and Trevor Vaile in Men Behaving Sadly Again in second place and Lyberty with their 4th third place. The final day’s racing was the best wind of the week and it brought a smile to the faces of all the DB Sailors. I must say a big thank you to the Rock Water Ski and Sailing Club for running a first class championship week with great credit going to Martin Hough and his race management Team for some excellent courses and great on the water work. Regatta Report by Tim Parkinson with much help from Nigel Young. This entry was posted in DB Weeks, Uncategorized and tagged 2014, Championship, Nationals, Rock on June 3, 2014 by Tim.